Home / Fandom / StarWars / The Most Surprisingly Common 'Star Wars' Names in The U.S. The Most Surprisingly Common 'Star Wars' Names in The U.S.
You'd be surprised by the number of people in the U.S. that have names from the Star Wars movies. Using People Search I was able to search all the names in the United States and came up with some funny results. Now you know that Darth Vader walks among us. To prevent harassment I'm leaving out specific details such as age and location. If you want to call Jabba D. Hutt and tell him you have a thermal detonator that's your business. But, you never got it from me. A beautiful name for a beautiful girl. For some reason only two people have it. They both live in the same state too. Go figure. A very popular name apparently. A few of the results are dudes in their fifties and sixties. That means these guys walked around with this name all their lives. I'll bet when Lucas came up with the name he had no idea it was real. Another popular name. I know there's a guy working at a local radio station who named himself Obi-Wan Kenobi. Seems sad since he's in his 30's. Why someone would name their kid after the Dark Lord of the Sith is a mystery to me. This is almost like naming my kid Hitler. On the other hand, I'll bet telemarketers never call him. They know the power of the dark side. The coolest guy in Star Wars. I always wondered what I'd use a time machine for. Now I know. I would go back in time and ask my Mom to name me Lando Calrissian. Then, ask for a Colt-45. 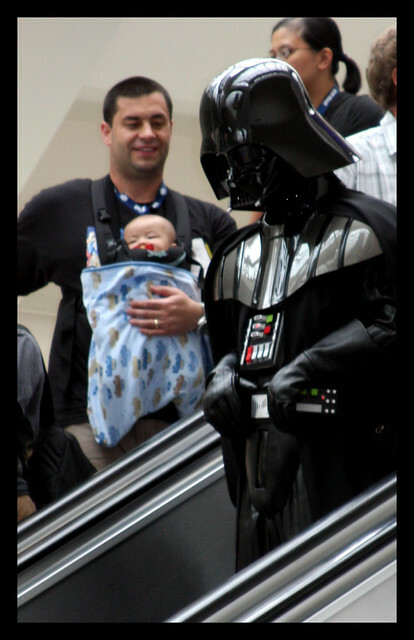 Would you name your kid after a Star Wars character? If so, which one? At least no one named their kid Wookiee. That would have to be one hairy kid. LoL...I'd have to seriously think on it before considering it. I do name pets after them though...had a Yoda once, and a Wicket. Anyway, it seemed the safest "she won't get beat up in school" name to give her out of the rest of them. A friend of mine named his kid Leia. "I wanted to be original!". Uh... It's a name from a movie. Hardly original, lol.